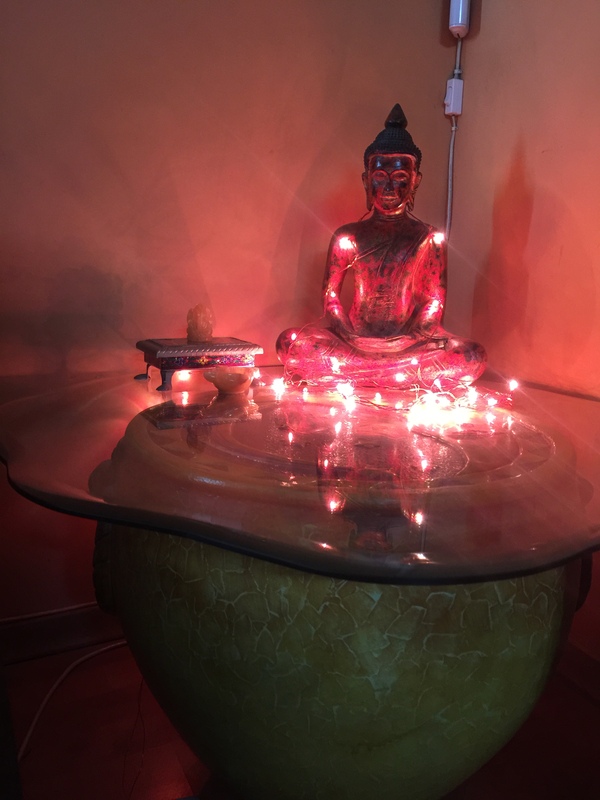 Yesterday, we made the Deepavali “marundu”…. with the mix that you had made in 2008. Yes, its still safe and not spoilt at all. We have kept it in an airtight bottle and anyway Hyderabad and Delhi have dry weather so things don’t spoil as easily. Appa, Amma and I were remembering how you would dry grind all the spices and sieve the powder till it was absolutely fine. Amma would do all the roasting…..
You were always big on following traditions and I have inherited that just now from you. In the initial years of my marriage, my mom-in-law ensured that we followed all the traditional festivals and then when we had that fiasco in the business, we lost track of many of the traditions because just survival became such a challenge. Then there were a few years where I went through the phase of not wanting to follow any tradition, thinking like many people have been led to think, that our festivals were a bit too loud. Now, I think its important for us to follow traditions after making some modifications to suit whatever the current environment is. So, this Deepavali, we have done the entire nine yards – Deepavali Marundu, Ribbon Pakoda, Nuts Ladoo for today’s South Indian Diwali and tomorrow we will wear new clothes, do the early morning oil bath and make “chakkara pongal” to celebrate the North Indian Diwali :). I am remembering how you would string the light bulbs and hang them outside on the veranda of our house at Dehu Road. 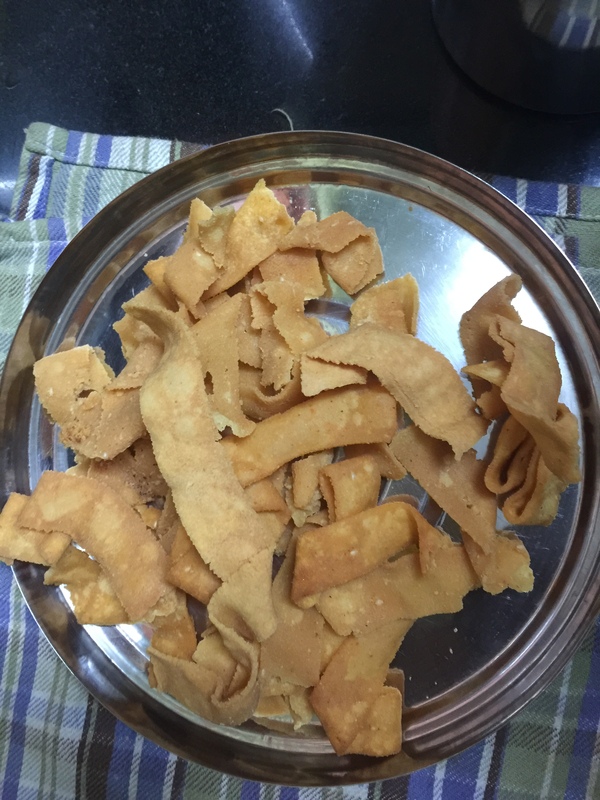 Then one Diwali, you hung the small thin crackers after separating them from the cluster. Amma would light only the “anar” and the “chakram” and of course the sparklers. We never bought too much, but we always bought some and infact, I threw out some of the crackers that you had kept safely on the loft in the Hyderabad home because they were really old. I don’t remember a single Diwali when we didnt have the “chakram” spinning on the verandah before sunrise and the slightly heated sesame oil with a few peppercorns being applied on my head by you, and a small ball of the “marundu” being eaten so it takes care of all the sweets and savouries that I would gorge on during the day… Nostalgia. We haven’t bought any crackers for a long time now as we subscribed to the thought that they lead to pollution and noise pollution .. the cities are very different now, Appa. No one will do anything about the ever increasing traffic with vehicles spewing noxious gases or the incessant construction contributing the dust, or the non-degradable plastic waste, all leading to a lot more pollution. But everyone says the crackers contribute to the pollution so we shouldn’t burst them !! Also in the condominium complexes, it is disturbing to have crackers go off everywhere, so there is a designated space where everyone goes and bursts crackers and thats a modification which makes perfect sense. Krishnan and I never went and saw the crackers being burst in Ridgewood, but tomorrow evening, we will. No, Amma won’t come even to watch, as always :):). 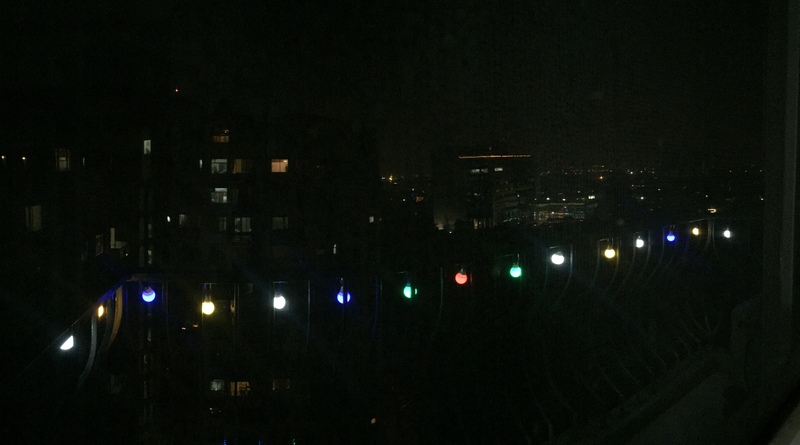 Appa, just now, our regular electrician, Nityanand came over and has hung a string of coloured lights on the balcony. Tomorrow he will hang another string on the other balcony and Amma is smiling away because she says now I am also behaving like you. Going forth, every Diwali we will have this string of lights and it feels good to deck up the house. How can we not be partial to the “Apple” :). 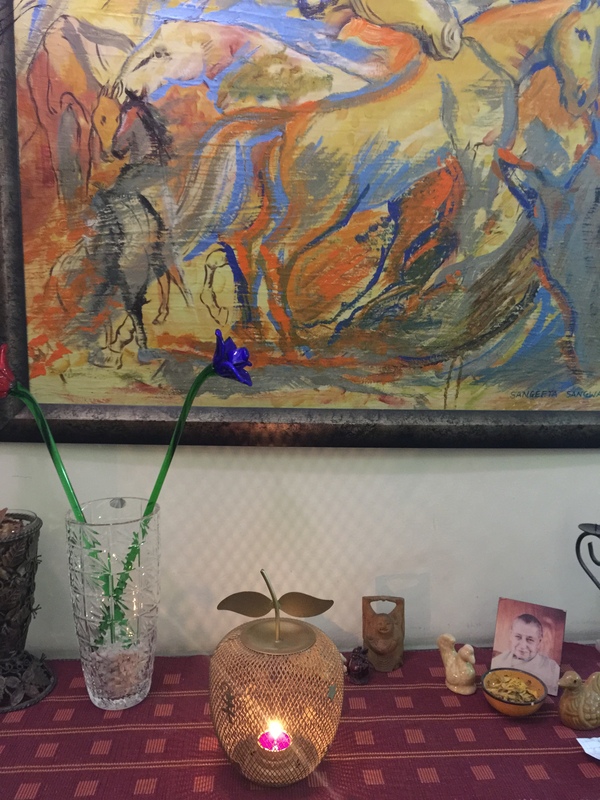 A tealight candle inside… Kumar Mani, your gift, the Aurobindo Mother greets everyone who comes home .. she is right at the entrance. Miss you Appa… even if I know you are right here, as part of all the festivities. Haven’t bought crackers this year too, but we might next year to complete the celebration. Amma is very happy today because she could “fry” everything, the “vadams” and the “ribbon pakoda”. 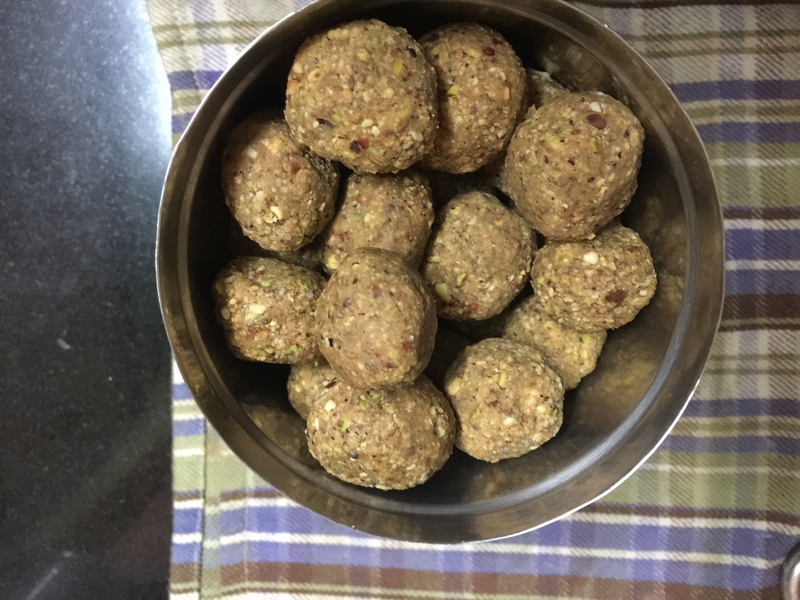 We have shifted to having jaggery with tea and coffee and thats another way that you are a part of our lives.. and there is a particular brand that comes from Gujarat that tastes really good. You would have loved the taste. Haven’t forgotten that you loved jaggery and would try to steal a few pieces from the goods train when you were a little boy. Life is good and thanks for all the memories and the traditions….will keep them up. Thank you for sharing your memories and a bit of Indian culture. The food looks delightful.